Two weeks ago after a solid effort at the IBM Uptown Classic 5K I started to feel like I was getting close. I wasn’t all the way back to where I was before our bout with Achilles/ankle issues, but I was starting to resemble that runner. I had lost that tentative feeling every time I dropped my hips a bit and tried to push pace down towards 6:00 flat. My stride was feeling very even and when I tried to lengthen things out just a bit, the snap had returned to my turnover. I still don’t have the volume that I typically do at this time of year, which is holding me back from jumping into the Run for the Water 10-miler next weekend, but I feel like with a few more weeks of quality workouts with the group I can build out my long runs back to 15-16 miles and be half-marathon ready by Christmas. I had mentally circled the Thanksgiving Day Thundercloud Turkey Trot as my next “A” race – trying to go for my 5-mile PR of 30:50, but there was another 5-miler in October that seemed to line up really well for us. The Cedar Park 5-miler which was celebrating the 18th running of the event. When I was building speed back in 2010 and making the fastest and largest gains in my performance I was racing hard and racing frequently. There is just no substitute for that kind of intensity and effort when you are trying to force adaptation. As the weather forecast came out for Sunday’s race about 5 days in advance showing cool temperatures, I decided to jump in and see just how far away we were from our previous effort at the 5-mile. A distance that is not very common here in Austin. Only a handful of opportunities each year locally to tee it up. I treated this past week as an “A” race week. 10 miles on Monday with an afternoon Swim, Tuesday – complete rest. Wednesday a short but intense speed session of 300 meter repeats with 100 meter recoveries in the 5:40-5:45 range. A Thursday 30 mile bike and swim followed by an off day on Friday and just a 2-mile shakeout on Saturday. A lot of short, intense workouts, with plenty of rest and very little volume that would leave my legs feeling fatigued. On Sunday morning for the first time since December of 2012. I would show up on race morning looking to go low and with any luck, have a chance to take down an 11-month old PR in the 5-mile. My first legitimate PR attempt in 2013. On Saturday morning I drove the course to measure the inclines along the route which features gentle climbing up to the turnaround point, with that same gentle decline on the way back home. A course that set-up for negative split miles, where going out under control would produce the fastest overall time, as opposed to running out fast to start and hanging on to the end. I thought that I needed to be very disciplined early, so that when the course tilted in my favor late in the race, I could actually do something about it. 6:20, 6:15, 6:10, 6:05, 6:00 would produce a time equal to our 30:50 PR. If I could hang tough through mile 4, perhaps I would have enough left to kick over the final 400 and eek out a new PR. That was the plan as I played those splits over in my head as I dozed off to sleep on Saturday night. It was the first race in a long time that I had planned out each mile along the course. A formula that had served me very well in the past. All I would have to do on the course is go out and execute. Pre-Race: We stuck to the program with a 6:00 a.m. alarm clock, shave and a shower to loosen up the muscles. A bagel and Gatorade breakfast and after changing into our race gear I left the house at 7:15 a.m. to get to the race site. I parked, retrieved my timing chip from the timing tent (ankle strap) and went back to the car to get ready. I decided on a slow 2-mile warm-up to get the muscles ready to go on a very chilly, but beautiful 45 degree morning. I ran the first mile of the course, measuring the incline of the opening mile, spun around and trotted back to the start. 2 miles, 14:50. Everything to this point was perfect. I changed into my New Balance Race flats, took off my sweats and headed over to the start area to run a few strides. With approximately 375 runners in the event, I was able to get in my last few reps, and then duck into the start area about 10-12 runners from the front. A lot of the usual suspects in attendance. Looked like if I ran well, I would have a shot at a top-10 finish – but all I was really hunting was that 30:49. Placement was irrelevant. Mile 1: We ran uphill leaving the shopping center and turned left onto Buttercup Creek Road. We would run the first 1.25 miles on a gradual incline until we would make a right turn onto Nelson Ranch. The race course was coned off into the bike-lane, which was enough room for 2-3 runners to run next to each other. This would not be an issue later in the race, but for the first mile we were running 4-5 to a group and it was congested. I glanced down at my watch repeatedly over this mile, making sure that I never dipped below 6:20. The pace felt relaxed and at a few moments I felt myself wanting to increase my stride. The first 1/2 mile was spot on in 3:10. Finally I was locked in and ticking things off smoothly. I was running somewhere around 10th or 11th place and had found a group to run with. I tried to disassociate a bit and not focus on the incline, just stay smooth and tall – no faster, no slower. At the mile 1 marker I glanced down at my watch. The course measurement was exact. Opening mile – 6:20. Perfect. Mile 2: As mile 2 started the course again started to climb just a bit. About 50 feet over this section of the course. No big climbs, just a gentle slope that you can barely see. A “False-Flat” as runners call it. The kind of slope that tricks you into thinking you are running your goal pace effort, but you are actually working just a bit harder than usual to hit that mark. At the end of the race, those :05-:07 seconds that you pushed for imperceptibly cost you twice as many when you go to your kick. I was hoping to run this mile at 6:15, but at the halfway mark I was right around 6:18-6:19. I felt myself get slightly discouraged. I decided to stay even through the end of the mile and see if I could wake things up a bit over mile number 3. At the mile 2 marker the watch beeped at me – 6:16. I was :01 behind after 2 miles. Mile 3: I decided to stick to the plan and press just slightly to drop pace down to 6:10. I had a good group to work with and we took turns leading the pack. Nobody was going much faster than 6:10-6:11 at any point, but it was nice to share that responsibility. I kept monitoring my watch every 400 meters or so, this would be the last mile that I would look at my watch as when we hit the 2-mile to go mark I would just run as hard as I could to close it out. We hit the 180 degree turnaround that required us to come to a near-stop at 2.5 miles. The slow-down cost us about :05 seconds. I pressed just a bit to get back on pace and locked in the harder effort. The course was finally tilting ever so slightly in our favor and I was able to make up those :05 seconds without expending too much precious energy. We hit the mile 3 marker with a 3rd mile in 6:08. 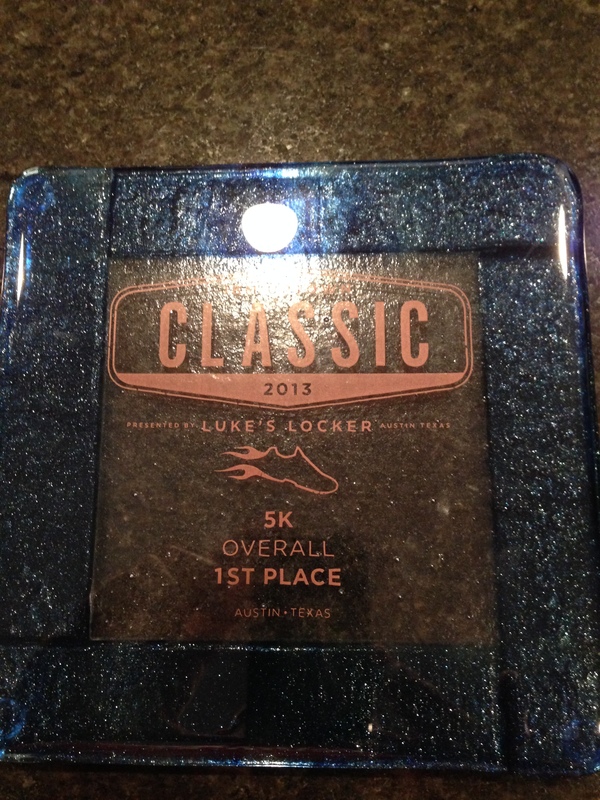 We were :01 seconds ahead of goal after 18:45 of racing. Mile 4: At the start of mile 4 I moved to the front of our small pack. I would use the footfalls behind me to keep me honest and from this point on I was going to run my race. If somebody was able to drop me, good for them, but I felt like I had run a very smart opening 3 miles. Now it was just a matter of seeing how much we had left. I snuck a glance down at my watch at some point over the mile and saw my pace below 6:00 flat. I thought about dialing things back ever so slightly to load up for the final mile, but it was time to run by feel at this point of the race. If 6:00 effort was producing sub 6:00 results, I chalked it up to the slight decline and went with it. At the beep I looked down and saw a 5:56 mile. Time to go. Mile 5: The final mile would roll up and down ever so slightly for the first 7/10 of a mile before a nice 3/10 of a mile descent to the finish line. I decided to press ever so slightly on the accelerator to keep the pace under 6:00 flat and then start to empty the tank at the start of the downhill. We were comfortably locked in at 5:55 pace at the start of the descent, and I could see the right-hand turn ahead that would lead to the finishing chute. The pace was starting to hurt quite a bit, but I could tell that I was holding strong, not losing any speed as I struggled to keep my form in place. We made the final turn and kicked to the finish. 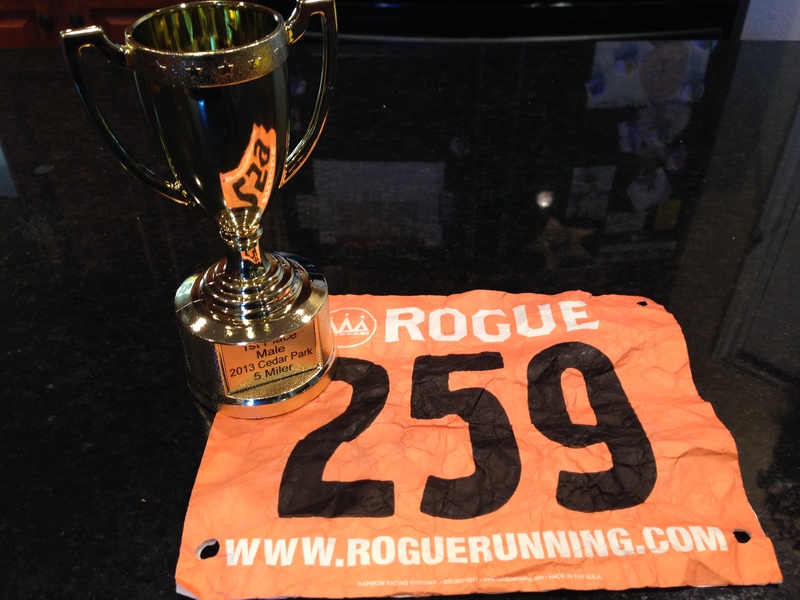 30:25 official time, 1st place Age Group, 7th place overall. Post-Race: Dawn and Landry decided to skip the race on Sunday and grab some extra sleep (I don’t blame them) – so I had some time to myself waiting around for the awards ceremony to begin. I replayed the race over in my mind a couple of times and tried to find a time where I executed my pre-race plan as well from start to finish. IBM Uptown in 2011 perhaps? Possibly the first 20 miles of the NYC Marathon. But never had I closed a race so strong before. It was the first time in 2013 that I exited an event completely satisfied in the result. Not a single thing I would change about my race on Sunday and with a :25 second PR in our pocket, we finally are off the shneid in 2013. Man, this sport never gets old. Now it is time to stop feeling sorry for myself and see how strong we can close out the rest of the year. We have 2 months and two events left to go. Perhaps we may have a shot at our 5K PR at Lights of Love in December. With 6 weeks to get ready – I’m starting to like our chances. A thought occurred to me on Monday as I was ticking off 10 miles at 7:15 +/- pace a day after the IBM Uptown Classic. Would I ever get all the way back to where I was last December. Usually negative thoughts get quickly squashed when I am out running on the trail. If I start to feel myself go down that path I quickly replace those thoughts with something positive from my past. A time when I was coming back from an injury and instead of struggling to get back to where I was, I focus on the fact that I actually got faster. Or a time when during a training cycle I expected a flat race performance, but actually surprised myself and ran a new PR. But this time it was different, I was simply being analytical and realistic. I am a year older now a 46-year-old athlete and this train is not going to keep going faster forever. I have had a very inconsistent year in 2013, lots of fits and starts. A few weeks or a month of great work then interrupted by an injury or forced time off. I would then build back as I did over the summer, then have another forced break. That is not the way to continue improvement. Consistency rules the day. So I have decided to shift expectations just a little bit and focus on 8 week periods. No downtime, no skipped workouts unless I am ill. Avoid injuries at all costs, just solid, consistent effort and mileage across the run, bike and swim. If we can close out the rest of 2013 without missing any more time we can flip the calendar into 2014 with some strong momentum. Ironman training is coming at perhaps the best time possible. Lots of longer workouts, lots of endurance work, lots of volume. Not a lot of short, burst, speedwork type workouts that can lead to overtraining and injury. I’m going to stretch more, be sure to get my strength training in at the Y on my swim days and try to focus on small incremental steps forward. I knew there was going to come a time when setting new PR’s became unrealistic and instead I needed to focus on competing in my age group or setting new 5-year interval PR’s. Fastest time after 45 or 50 years old, that kind of thing. It happens to all of us. But if for one magic moment on a race day I happen to show up to the starting line 100% fit and 100% healthy – then perhaps we’ll go for it. 18:02, 30:50, 37:30, 1:03:55, 1:23:31, 3:08:09. Those might be the 5K, 5-Mile, 10K, 10-Mile, Half-Marathon and Marathon times we have to live with forever. I’m by no means giving up hope or throwing in the towel at this point. But if that is indeed the case, I think I can live with those numbers. Pretty respectable for a 40 lb. overweight 38 year old guy who decided to start jogging at lunch one day with no plans to even jump in a local 5K. We’ve been to Boston a couple of times, New York City, raced in TX, NY, PA, VA, CO, SC and MA. The fun part about this sport and triathlons is that there is always another challenge around the corner. You just have to keep moving forward and not let any setbacks get you down or especially keep you down. 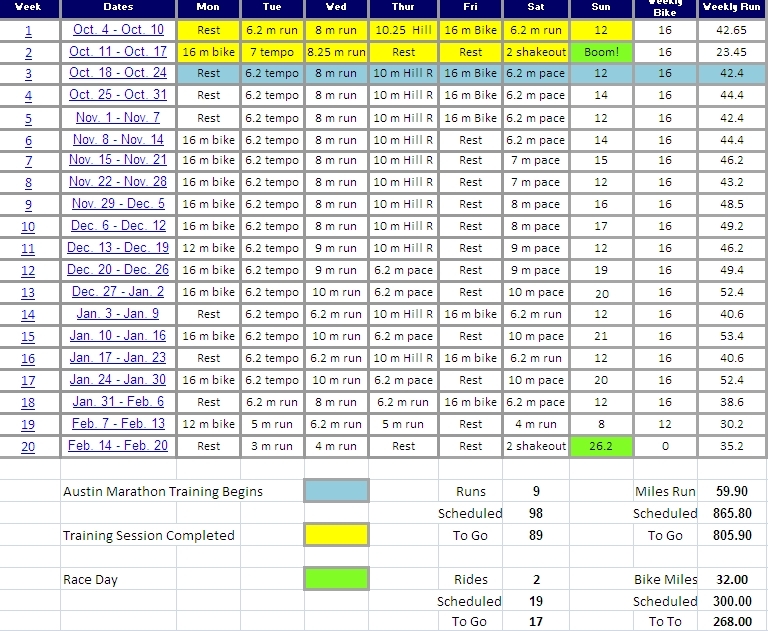 So here’s to wrapping up 2013 with a couple solid months of training and see if we can make a little noise down at Ironman TX. It’s going to be fun trying to climb that mountain one more time.